Pain in my heart, tears in my eyes, I write you this letter, dear Leah, the young, brave, brilliant girl kidnapped by Boko Haram, whom they have refused to release with her colleagues for crazy reasons, including not denouncing her faith. Tears have been shed, supplications made, but you haven’t been allowed to go home to your family and friends. President Buhari assures you would soon be freed, but you haven’t. We wait with bated breath. We pray daily for your freedom! You were in school preparing for your exams, with great dreams for the future. You had big dreams, to be a doctor, scientist, engineer or lawyer. Then, they came. The men from the dark, with hearts of darkness. They stormed your hostel and took you and some of your other colleagues away, to God-knows-where. Since then, we all – your family, schoolmates, friends and even those who do not know you – have been awaiting your return. But it has been like waiting for Godot. It is either no news, half news, unsubstantiated news, photo flash, some hideous voices making promises not meant to be kept and so on. The government says you will return home safe and sound. We just hope and pray so. But, the bottom line is: You have not returned. Until you and other Boko Haram abductees return sound and healthy, we will continue to take the promises of government with caution and circumspection. This is where I honestly believe we must always appreciate people like the vocal and courageous Dr. Oby Ezekwesili and her colleagues in the #BringBackOurGirls campaign for keeping the fire burning. Were it not for them, many would have since moved on with their lives. Not many Nigerians have long memories, especially when they are not the ones directly affected. Dear Leah, do not ask who I am. I am just a concerned Nigerian, a writer and public commentator, who has done several write-ups expressing his worries about your plight, and other victims of Boko Haram abductions, which is our collective plight. But I know you, even when you know me not. True, we may not have met ‘face-to-face,’ as we say here. But I can connect to you in the subconscious, in the spirit. I have seen your photograph published many times in the newspapers, in the long, sad list of the abducted. I weep in my heart anytime I see your face and others being flashed in the newspapers and television. Recently, pictures of the abducted were on global news outfit, CNN, released by your abductors just to show you are still alive. But, surely you cannot be said to be okay. No one who has been an unwilling hostage of rough fellas clutching AK47s, and high on things we don’t know can be said to be truly fine. We hear that your abductors have even sowed seeds of the womb in some of the abducted girls; and some may have given birth to ‘baby Boko Haram.’ That is quite frightening. Will baby Boko Haram grow up in the ways of ‘father’ Boko Haram? What a world we will have! Leah, anytime I see a 13 or 14-year-old girl either going to school or on the playground during festive periods, I can’t help remembering you. I can’t help imagining that any of the young girls on the streets could have been among the abducted, and kept in the prison of Boko Haram, separated from the love and warmth of family and friends. I can’t help imagining what you have been through since the night of terror, when the marauders abducted you and your mates. In your face, I see fear, I see confusion, I see embarrassment. Of course, there’s unspeakable pain and agony. I see the indifferent look of the stoic, one whose spirit remains unbroken, despite her travails. I am sure it is that unbreakable spirit that has kept you and your mates going, some for over a couple of years now. Do I see anger? Yes, subdued anger. Indeed, you and your colleagues do have a right to be angry with us, the adult population. No one will blame you if you are, at this time, mad at your nation and government. This indeed is one of the reasons I write you this letter, Dear Leah, as a sort of self-purgation. Yes, we failed you. Your government failed you. We all failed you in your moment of distress. How can any sane mind rationalise the fact that a group of people, for whatever reasons or grievances, would storm a school hostel and abduct over 200 of our citizens, hapless young girls, and, in the case of Chibok, three years after, we still can’t find or free them? How can it happen that the most populous black nation on earth, some say most powerful nation, will have her hapless citizens in the firm and wicked grasps of kidnappers and, for three years running, we can’t say for certain when they all would be freed? In other climes, the country would literally shut down, as the angst of the citizens would compel the heartless abductors to let go their captives. In saner climes, we would not leave the wailing and gnashing of teeth to only the families and relatives of the abducted. The citizens would be on the rooftops and the streets, demanding of their leaders to do something urgent or stop calling themselves our leaders. If government can’t protect or safeguard the lives of its citizens, then there’s a big question mark. Even our Constitution expressly states that government exists to safeguard lives and property of her citizens. Dear Leah, you must pardon my outburst. It is how emotional the Chibok and Dapchi issues stand for some of us. It is how depressing the issue is, especially as no one can assure us in definite terms when you will return home. So, I am writing to let you know that you are not alone even in your lonely abode. But, the question is: Am I even sure this mail will get to you? Will the stone-faced guys, hooded like Robin Hood and Rambo, with assault rifles and other dangerous weapons, keeping eagle eyes on you, their prized hostage, their human shield against the military forces on their hot trail, ever let you receive any message from friends, relatives and other well-wishers? For me, it makes no difference whether Boko Haram allows you to read this letter or not. I write in the hope that, someday, and hopefully soon, you will breathe the air of freedom and you and your colleagues will get to read this letter, because someone who knows someone that knows you or any of the girls will tell you that not all Nigerians cowered in the cloak of cowardice or indifference when it mattered most. Goodnight, dear young friend, Leah, as I rest my case for now, even as your case is not yet closed! N.B. 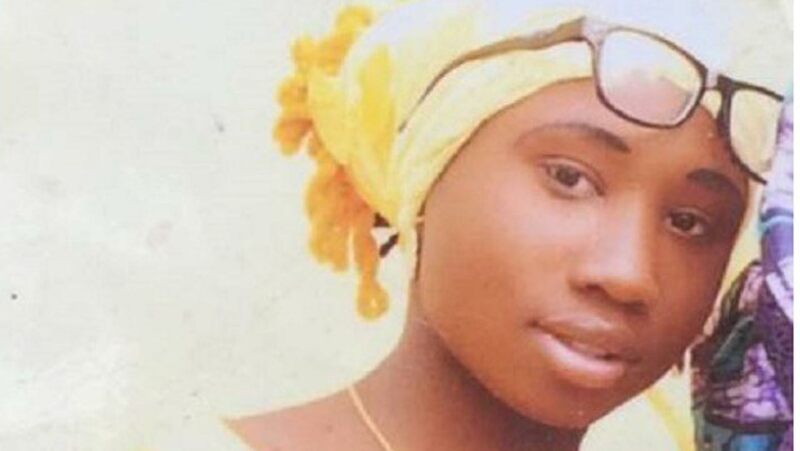 This piece, first published May 21, is being re-run as a result of the currency of The Leah Sharibu issue, and also as a continuous reminder to other Nigerians that, as long as Leah remains in captivity, we too cannot be said to be truly free. Same goes for the other Chibok and Dapchi abductees. 2019 cannot be more important than the lives of young Nigerians trapped in kidnappers’ den. Is anyone listening? The most painful security challenges of the common Nigerians citizenry in NIGERIA today! Leah Shairbu, Chibuk girls and countless children, women and men are victims in the captivity of the lion-den of the politically masterminded and sponsored Boko-haran terrorists! A failed Government is constitutionally said to be any Government that cannot protect the lives and prosperities of the citizens, as the senerio of the present day NIGERIA is! Political cabals are the main threat to the NIGERIANS, and they are the real cause of all the security threats and problems in NIGERIA! Boko-haran terrorists and Fulani’s herdsmen deadliest terrorists are their political tugs, which they frequently use to achieve their selfish and self-centeredness, at the detriment of other people of NIGERIA! Like the writer of the above write up rightly said, with the help of God Almighty, Leah Shairbu, Chibuk girls, all the countless children, women and men in the lion-den of politically masterminded Boko-haran terrorists, shall surely breath the oxygen of freedom one day, soonest!